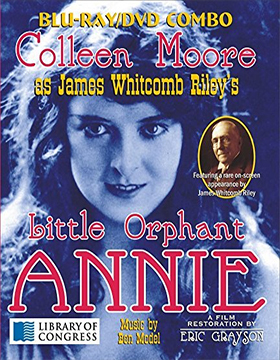 Ben Model’s Undercrank Productions will be delivering a Blu-ray/DVD Combo Pack edition — celebrating the 100th Anniversary — of director Colin Campbell’s 1918 silent film classic, Little Orphant Annie (that’s correct … not orphan but “orphant”). The iconic silent film star, Colleen Moore, stars as James Whitcomb Riley’s Annie, which Undercrank — working with film historian and archivist Eric Grayson and the Indiana James Whitcomb Riley Centennials — has selected Apr. 17 as the street date for the home entertainment Blu-ray debut, which, by the way, is the earliest surviving Moore feature film available. Greyson, working with various surviving elements and The Library of Congress (which had six minutes of the original 35mm nitrate print — with various tints) has been able to not only deliver a final work product that will have collectors singing his praises, but through tireless research on his part has finally reassembled the film in its proper theatrical sequential release order (from a collector’s original script for the film) … that’s all 57 minutes properly restored! Bonus features include commentary from Eric Grayson, who is joined by Colleen Moore's biographer, Jeff Codori, and historian Glory-June Greiff, a video session with Eric Grayson and Glory-June Greiff reads Riley’s poem “Little Orphant Annie” and excerpts from “Where is Mary Alice Smith?” (the real Orphant Annie).